Traveling by a dark graveyard or cemetery at night can be a frightening thing, especially when the imagination comes into play and every crack of a stick or gust of wind lends the passer-by to think something more nefarious is afoot. Add to the experience something that’s truly out of sorts, and it can be downright frightening. Take, for example, a frequently reported odd phenomena seen in graveyards and cemeteries: the mysterious light or glowing grave. You can see it, usually from a point just outside of the burial ground affected, and like any other unexpected things, you feel scared, confused, or curious: maybe a little of all three. You don’t know what it is, but it just feels wrong. The Bay View Cemetery in Middletown possesses one such mysterious lighting phenomena and because if the graveyard has come to be known in local lore as the “Green Light Cemetery.” A number of people have written to Weird NJ over the years about the strange illumination that gave it that name: a mysterious green light that appeared above the cemetery’s tree line. 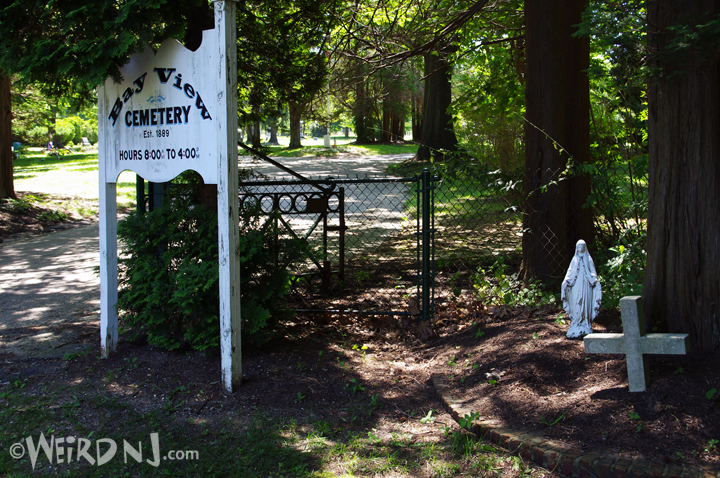 One story behind it involves a caretaker who lived in a house behind the cemetery. 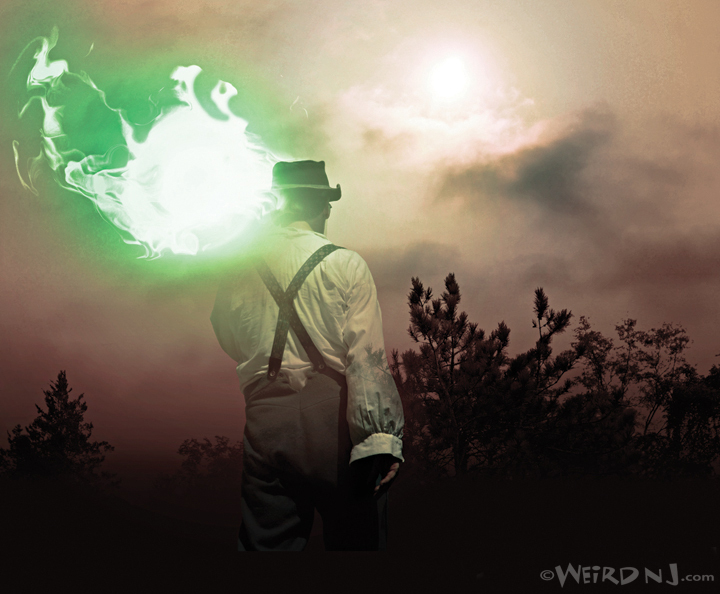 He died, and each night his ghost would light a green lantern as a beacon to help the spirits — who never seem to be good with directions — find their way. To where, we don’t know. Paul grew up knowing a different story about the light’s origin. Paul could see the light from his room until 1989, and its disappearance was mystifying until he’d learn a few years later that the light source, “May have been an old lighthouse that sat up in the hill, buried in the woods behind the cemetery.” Even that was cause for wonder, because it wasn’t clear who was keeping the beacon lit (and the story going) up until that point. 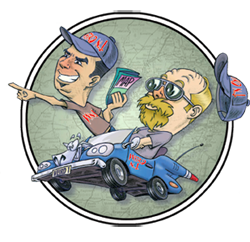 He and friends located the lighthouse one night in 1993, after driving away from the cemetery and further uphill along King’s Highway, near a housing development that was at a higher elevation. The lighthouse looked, Paul said, a lot like a similar, but abandoned lighthouse “On the shore of the Leonardo beach.” People he spoke with in the community said both “were (once) used to help boats in the bay to find the shore.” The lighthouse closer to the cemetery became irrelevant when nearby trees grew tall enough to obscure it from the shoreline. Hosford Avenue, in the Chapel Hill section of Middletown, aka Beacon Hill, is a very unassuming and quiet area. 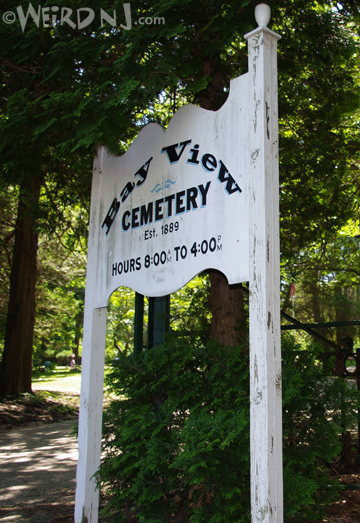 Going virtually unnoticed along the road, nestled in the woods at the bottom of a large hill, lies the Bay View Cemetery––which is more commonly known is local mythology as “Green Light Cemetery”. In the evening, it’s an eerie setting, especially when the trees are devoid of leaves. Driving up Hosford Avenue, darkened by the absence of street lights, a short distance beyond a bend in the road, the graveyard comes into view, blanketed by an eerie green light which emanates through the trees from the hill above. If anyone tries to search for the source of the light, they will be forever consumed by the forest surrounding the cemetery…or so the legend goes. Having heard the mysterious tale for most of my life, I decided to do some research on green light a few years back and found that the proper name of the lighthouse wass the Chapel Hill Lighthouse, which was erected in 1856, and was a rear range light. It worked with the Conover Beacon on the shore of Sandy Hook Bay at Leonardo. Together, the lights marked the Main Channel Range into Sandy Hook Bay. This is one of six little lighthouses, four along the bayshore in Keansburg and Middletown, and two on Staten Island. They were built to help ships navigate through the deep-water channels and avoid the shallow waters that might have stranded them in the bays. When the two lights appeared to line up (the one on the hill and the one at the shoreline), it was a signal to ships in the bays that they were safely navigating in deep enough waters. 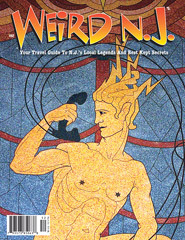 Weird NJ magazine, “Your Travel Guide to New Jersey’s Local Legends and Best Kept Secrets,” can be found on newsstands throughout the state and can be ordered online through our shopping cart or our Amazon Store. 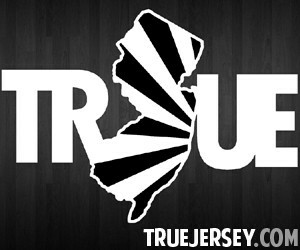 This entry was posted in Cemetery Safari, Stories and tagged bay view, cemeteries, ghost light, ghosts, graveyards, green light, lighthouse, middletown, monmouth county, mystery light, spooklight. Bookmark the permalink.